Thrombospondin 1 antibody LS-C511631 is an AP-conjugated mouse monoclonal antibody to Thrombospondin 1 from human, mouse, rat and other species. Validated for Flow, IF, IHC, IP and WB. Alkaline Phosphatase. Also available conjugated with , APC, Biotin, FITC, HRP, PE. Reduced and alkylated puri?ed human TSP (fully denatured) from the supernatant of thrombin-activated platelets. 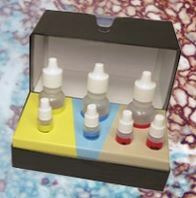 MW of Antigen: ~450kD (non-reduced), 170-180kD (reduced). Epitope: Collagen Type V-binding domain of TSP. Recognizes Thrombospondin. Shows no cross-reactivity with fibronectin, fibrinogen and von Willebrand factor. Shows a mild cross-reaction with TSP 2. Inhibits TSP-collagen interaction. Antibody binding to TSP is unaffected by glycosaminoglycans (e. g. hyaluronic acid, chondroitin sulfate and heparin). Its binding is enhanced by EDTA i. e. at low concentration of Ca2+. Species cross-reactivity: Human, bovine, porcine, equine, canine, sheep, mouse and rat.